Veno-venous extracorporeal carbon dioxide (CO2) removal (vv-ECCO2R) is increasingly being used in the setting of acute respiratory failure. Blood flow rates range in clinical practice from 200 mL/min to more than 1500 mL/min, and sweep gas flow rates range from less than 1 to more than 10 L/min. The present porcine model study was aimed at determining the impact of varying sweep gas flow rates on CO2 removal under different blood flow conditions and membrane lung surface areas. Two different membrane lungs, with surface areas of 0.4 and 0.8m2, were used in nine pigs with experimentally-induced hypercapnia. During each experiment, the blood flow was increased stepwise from 300 to 900 mL/min, with further increases up to 1800 mL/min with the larger membrane lung in steps of 300 mL/min. Sweep gas was titrated under each condition from 2 to 8 L/min in steps of 2 L/min. Extracorporeal CO2 elimination was normalized to a PaCO2 of 45 mmHg before the membrane lung. Reversal of hypercapnia was only feasible when blood flow rates above 900 mL/min were used with a membrane lung surface area of at least 0.8m2. 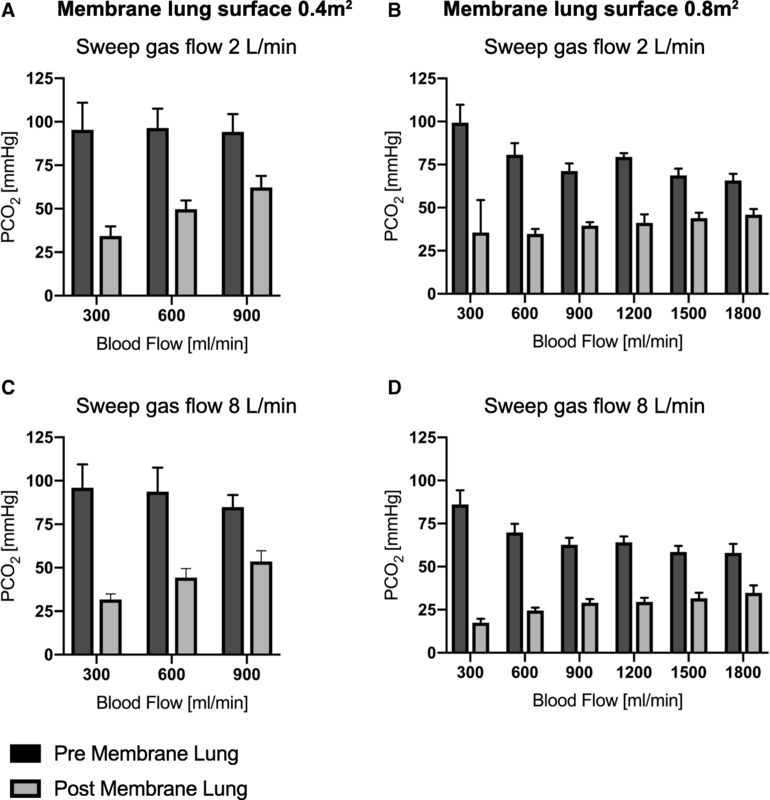 The membrane lung with a surface of 0.4m2 allowed a maximum normalized CO2 elimination rate of 41 ± 6 mL/min with 8 L/min sweep gas flow and 900 mL blood flow/min. The increase in sweep gas flow from 2 to 8 L/min increased normalized CO2 elimination from 35 ± 5 to 41 ± 6 with 900 mL blood flow/min, whereas with lower blood flow rates, any increase was less effective, levelling out at 4 L sweep gas flow/min. The membrane lung with a surface area of 0.8m2 allowed a maximum normalized CO2 elimination rate of 101 ± 12 mL/min with increasing influence of sweep gas flow. The delta of normalized CO2 elimination increased from 4 ± 2 to 26 ± 7 mL/min with blood flow rates being increased from 300 to 1800 mL/min, respectively. The influence of sweep gas flow on the CO2 removal capacity of ECCO2R systems depends predominantly on blood flow rate and membrane lung surface area. In this model, considerable CO2 removal occurred only with the larger membrane lung surface of 0.8m2 and when blood flow rates of ≥ 900 mL/min were used. Veno-venous extracorporeal CO2 removal (vv-ECCO2R) is increasingly being used in the setting of acute hypercapnic and hypoxemic respiratory failure to facilitate protective ventilation, allowing early extubation or even to avoid invasive mechanical ventilation [1–9]. In this context, ECCO2R blood flow rates range from 200 mL/min to more than 1500 mL/min [10–12], depending on the primary treatment aim . Much effort has been spent in the last decade to increase CO2 removal capacity by modifying the circuit and the system [13–15]. With respect to possible technical modifications, blood flow rates, sweep gas flow rates and membrane lung surface areas may be manipulated by the treating team at the bedside. Among these, blood flow rates were reported to have the strongest impact on CO2 removal capacity [16, 17]. It was recently demonstrated that applying blood flow rates of 1000 mL/min with an appropriate membrane lung surface can remove about 50% of total CO2 production and, therefore, can correct even severe respiratory acidosis . Less is known about the influence of sweep gas flow in the setting of typical ECCO2R blood flow rates, especially in regard to different membrane lung surface areas. This is of particular importance since membrane lung surfaces from 0.4–1.3 m2 also clearly impact on CO2 removal capacities independent of the blood flow level . Furthermore, CO2 removal capacity is not only dependent on technical circumstances of the system, but also on the absolute CO2 content of the blood. Most of the CO2 of the body is stored as bicarbonate (HCO3−) in slow reacting compartments such as bone [19, 20] and is, therefore, not directly accessible for CO2 removal. Only 1–5% of the total CO2 content is dissolved in the blood and can thus be extracorporeally removed. Importantly, the amount of soluble CO2 is strongly correlated to the absolute CO2 level in venous and arterial blood. Therefore, normalization of CO2 removal to a PCO2 of 45 mmHg before the membrane lung allows for the comparison of different settings independent of the amount of PCO2 before the membrane lung . The aim of the current study was, therefore, to determine the effect of varying degrees of sweep gas flow on normalized CO2 removal using a clinically typical range of blood flows for ECCO2R via a porcine model of severe hypercapnic respiratory failure. For the vv-ECCO2R system, two different membrane lungs (Getinge, Maquet Cardiopulmonary Care, Rastatt, Germany) based on the Rotaflow® platform were used. The membrane lungs consisted of a polymethylpentene membrane with surface areas of 0.4 and 0.8 m2, respectively. These surface areas have been chosen due to the previous results  and current clinical practice in centres applying ECCO2R with different systems (0.4 and 0.8 m2). Both membrane lungs have a comparable rhomboid design. The systems were primed with normal saline solution. Heparin (5000 IE) was added to the running system, and bolus application of 5000 IE every 2–3 h was used during the running of the systems to avoid clotting. For venous access, a 23 Fr Bicaval Avalon ELITE Dual Lumen Cannula® (Getinge Group, Maquet Cardiopulmonary Care, Rastatt, Germany) was inserted into the right jugular vein. Correct placement of the cannula was confirmed by echocardiography. The membrane lung with 0.4 m2 was measured with system blood flow rates of 300, 600 and 900 mL/min, whereas the membrane lung with 0.8 m2 was measured with system blood flow rates from 300 to 1800 mL/min in increasing steps of 300 mL/min, respectively. For each single membrane lung surface area and blood flow rate, sweep gas flow was titrated in steps of 2 L/min increasing from 2 L/min to 8 L/min with a delivered oxygen fraction of 1.0. The study was approved by the Animal Research Committee of Uppsala University/Sweden (ethical approval number C77/16). Pigs (body weight = 39 ± 2 kg) were anaesthetized with IV ketamine 25–50 mg/kg/h, midazolam 90–80 μg/kg/h, fentanyl 3–6 μg/kg/h, and rocuronium 2.5–5.0 mg/kg/h was added when adequate anaesthesia was ascertained by lack of response of painful stimulation between the front hooves. The trachea was intubated with a cuffed endotracheal tube (inner diameter, 7 mm). The pigs were ventilated with a Servo-i ventilator (Maquet Critical Care, Solna, Sweden). Body temperature was kept at 38 °C throughout the study period by use of a heater cooling unit (Maquet Critical Care, Solna, Sweden). Arterial blood was sampled from the left carotid artery. The estimated CO2 production in this setting is about 200–280 mL/min in pigs [22, 23], which is comparable to a resting adult human. Vv-ECCO2R was performed in nine pigs following endotracheal intubation, mechanical ventilation and induction of hypercapnia by increased dead space ventilation, as described previously [16, 18]. Anatomical dead space was increased by adding an additional tube between the endotracheal tube and the “Y” piece of the ventilator circuit. The length of the additional tube was titrated until hypercapnia was induced with a target PaCO2 value ranging between 90 and 110 mmHg. The animals were ventilated in a volume-controlled mode with a tidal volume of 220–250 mL, a positive end-expiratory pressure of 5 cmH2O and a breathing frequency of 14–16/min. The dead space fraction and minute ventilation were subsequently maintained for the entire duration of the experimental period after having reached equilibrium with the target PaCO2 of 90 to 110 mmHg. The experiments were performed in each pig in a standardized fashion. PaCO2 was equilibrated between every system for at least 30 min. When PaCO2 was stable at the target, blood flow was increased stepwise from 300 mL/min to 1800 mL/min. At each blood flow level, sweep gas flow was titrated from 2 to 8 L/min in steps of 2 L/min. Blood gas analysis was performed with an ABL 800, Radiometer, (Copenhagen, Denmark) with separate measurement for haemoglobin. Extracorporeal CO2 removal was calculated as reported in detail in previous studies [18, 24, 25]. Of note, to compare the amount of CO2 removal at different pre-membrane PCO2 levels, the extracorporeal CO2 removal was normalized to a PCO2 of 45 mmHg. This normalization allowed comparison of CO2 removal rates at different PCO2 levels, since CO2 removal in general is markedly dependent on the amount of soluble CO2 (and thus of PCO2) in the blood . In more detail, the authors are aware that it is difficult to normalize CO2 removal to a specific PaCO2 precisely, since CO2 can also be dissolved from bicarbonate. However, the carbon dioxide dissociation curve is quite linear in the PCO2-interval in our study, i.e. when PCO2 is reduced (in our study by the ECCO2R system), this will reduce the blood content of carbon dioxide according to the slope of the curve. Another factor that affects the CO2 removal is the Haldane effect; since blood PO2 increases in the ECCO2R-membrane, the Haldane effect will cause a parallel shift downwards of the CO2 dissociation curve, and thus the difference between two PCO2 levels will be more pronounced [27–29]. For statistical analysis, GraphPad Prism 7 for Macintosh computer (La Jolla, CA 92037, USA) was used. Data were tested for normality using the Kolmogorov-Smirnov test. All data are given as mean with standard deviation. For independent comparison, normalized CO2 elimination (Figs. 1 and 2 and Table 1) was calculated by normalizing the partial pressure of CO2 before the membrane lung to 45 mmHg to compensate for different PCO2 levels pre-membrane lung as previously described [18, 21]. Non-normalized extracorporeal CO2 removal (Fig. 3) with different CO2 levels pre-membrane lung are presented in Fig. 4, demonstrating a blood flow-, sweep gas flow- and membrane lung-dependent CO2 removal capacity. 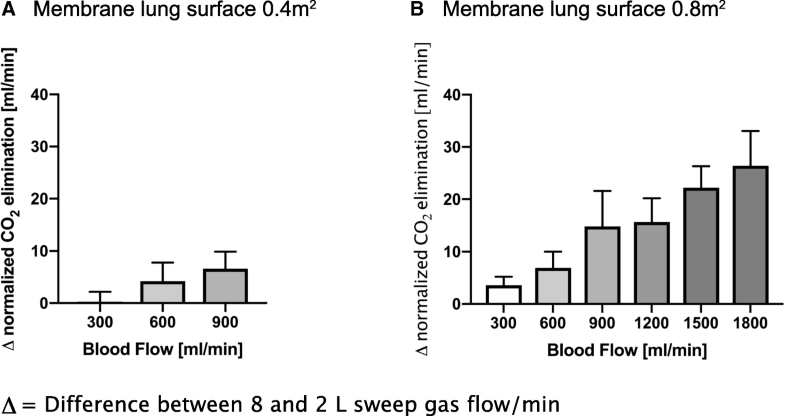 The membrane lung with a surface of 0.4 m2 allowed a maximum normalized CO2 elimination rate of 41 ± 6 mL/min with 8 L/min sweep gas flow and 900 mL blood flow/min (Fig. 1 and Table 1). Increase of a sweep gas flow from 2 to 8 L/min, at its maximal effect, increased the normalized CO2 elimination from 35 ± 5 to 41 ± 6 mL/min at 900 mL blood flow/min, whereas at lower blood flow rates, any increase was less effective, levelling out early on at 4 L sweep gas flow/min. The membrane lung with a surface area of 0.8m2 showed comparable results within blood flow rates from 300 to 600 mL/min, although the absolute amount of CO2 removal was higher than with a surface area of 0.4 m2 (Fig. 1 and Table 1). However, the effect of increased sweep gas flow from 2 to 8 L/min was comparable to the smaller membrane lung. When progressing from 900 mL/min up to 1800 mL/min, there was an increasing effect of increasing sweep gas flow on extracorporeal CO2 elimination (Table 1). Blood flow rates of 900 mL/min showed an increase in normalized CO2 elimination from 55 ± 9 to 70 ± 14 mL/min (delta normalized CO2 elimination of 15 mL/min) by increasing the sweep gas flow from 2 to 8 L/min. With each step of increase in blood flow (steps of 300 mL/min), the influence of increased sweep gas flow also increased. Accordingly, the maximum delta between 2 and 8 L sweep gas flow/min (26 ± 7 mL/min) occurred with 1800 mL blood flow/min. Of note, Fig. 4 demonstrates a linearly decreasing CO2 pre-membrane lung with increasing blood flow rates (Figs. 4a and b) with a more pronounced effect with higher sweep gas flow rates (Figs. 4c and d). The present study provides the most comprehensive overview to date of the influence of sweep gas flow on the CO2 removal capacity of ECCO2R systems with varying blood flow rates and membrane lung surface areas as used in this model. It adds to previous animal studies on technical determinants of successful vv-ECCO2R. While two former studies using a comparable study design have primarily focused on the impact of the blood flow rate  and the membrane lung surface area , respectively, on the capability of the system to remove CO2, the present study aimed to determine the role of the sweep gas flow in the intersection of these three key components of vv-ECCO2R. The main finding is that the impact of the sweep gas flow varies depending on the size of the membrane lung and the chosen blood flow rate. Thus, the impact of the sweep gas flow rate is clinically negligible when using a small membrane lung surface area of 0.4 m2 in addition to blood flow rates of up to 900 mL/min. In contrast, the impact of the sweep gas flow rate appears to be clinically more critical when using a larger membrane lung surface of 0.8 m2. In this case, the difference of the CO2 elimination, following mathematical normalization to 45 mmHg when comparing 8 and 2 L sweep gas flow per minute, is at least 10 mL/min or even higher at a blood flow rate of 900 mL/min, and this difference appears to gradually increase when using even higher blood flow rates. Eventually, this difference reached approximately 25 mL/min at a blood flow rate of 1800 mL/min, taking into account that normalized CO2 elimination is calculated, thus the real CO2 removal capacity might be even higher if CO2 before the membrane lung is above 45 mmHg. The present findings confirm one of the previous porcine studies on pathophysiological and technical considerations of ECCO2R . This study had already signified that the capability of extracorporeal CO2 removal rises with increasing sweep gas flow rates. However, the experiments of increasing sweep gas flow rates in this former study were performed with a fixed blood flow rate of 1000 mL/min. Therefore, the current study adds to the existing knowledge in so far as the increased capability to extra-corporally remove CO2 at higher sweep gas flow rates is substantially greater with higher blood flow rates, but negligible with a blood flow below 600 mL/min. However, in view of the current and the previous findings, the amount of blood flow still appears to play the most important role for the success of vv-ECCO2R. Nevertheless, current evidence, including the present trial, now suggests that there is a complex interplay between the three major selectable regulating variables, i.e. blood flow rate, sweep gas flow rate and the membrane lung surface area. The present study has some important clinical implications: First, severe hypercapnia is most sufficiently handled by ECCO2R with a large enough membrane lung surface area (≥ 0.8 m2) using higher blood flow as well as sweep gas flow rates. Second, to achieve the desired results for vv-ECCO2R, the main technical determinants of vv-ECCO2R (membrane lung surface area, blood flow rate and sweep gas flow rate) should be assessed before starting up the procedure. In addition, in order to adequately compare different methods, these technical conditions have to be determined in advance and reported in clinical studies. This may be most relevant in future clinical trials with adaptive designs which are dependent on the CO2 removal capacity. The present study has some limitations related to the porcine model used and the calculated CO2 removal. These limitations have been extensively discussed in the previous publications on vv-ECCO2R using a very similar setting for the animal experiments and are, therefore, with reference to the previous studies only briefly addressed [16, 18]. First, data acquired in pigs cannot automatically be transferred into the clinical scenario; however, it has been shown that CO2 production in pigs is comparable to CO2 production observed in adult humans requiring mechanical ventilation , likely allowing comparison. Second, the typical clinical scenario of exacerbated chronic obstructive pulmonary disease (COPD) with severe airflow limitation was not simulated. Therefore, the interaction between vv-ECCO2R and mechanical ventilation could not be investigated. Third, the animals were not critically ill and had a normal CO2 production in contrast to patients with an acute exacerbation of COPD or with sepsis, who usually have higher CO2 production. Therefore, the conclusions regarding the clinical effectiveness of different systems used for vv-ECCO2R in the clinical setting must be tempered. The influence of sweep gas flow on the CO2 removal capacity of ECCO2R systems depends predominantly on blood flow rate and membrane lung surface area. In this model, considerable CO2 removal occurred only with the larger membrane lung surface of 0.8m2 and when blood flow rates of ≥ 900 mL/min were used. Furthermore, it can be emphasized that sweep gas flow has a significant impact on CO2 removal capacity in ECCO2R, but only if blood flow rates of 900 mL/min and above are applied. Finally, in regard to future ECCO2R clinical trials, especially those with adaptive designs, it will be important to understand the influence of sweep gas flow in the intersection of blood flow, membrane lung surface area and sweep gas flow. This study was in part funded by the German Federal Ministry of Education and Research No. 13GW0219B and by the Swedish Lung and Heart Foundation. CK designed the study (together with StSt, SiSc, JdM and MM). CK, StSt, JdM, SiSc and MM performed the experiments and data acquisition and analyzed the physiological data together with all co-authors. All authors read and approved the final manuscript. The study was approved by the Animal Research Committee of Uppsala University/ Sweden (ethical approval number: C77/16). CK received travel grants and lecture fees from Maquet, Rastatt, Germany; StSt received travel grants and lecture fees from Maquet Cardiopulmonary, Rastatt, Germany; and WW received fees for advisory board meetings and lectures from Maquet Cardiopulmonary, Rastatt, Germany. CK and WW received an open research grant for the hospital from Maquet Cardiopulmonary, Rastatt, Germany. A.L, JdM, MM and SiSc reported no conflicts of interest. DB reports serving as the cochair of the trial steering committee for the VENT-AVOID trial sponsored by ALung Technologies; serving on the medical advisory board for Baxter; and previously serving on the medical advisory boards of ALung Technologies and Kadence (Johnson & Johnson), with all compensation for these activities paid to Columbia University.